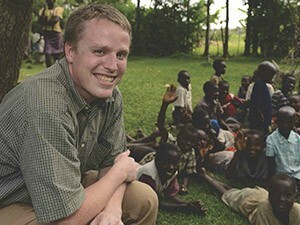 While working in Kenya, Linguistics Professor Michael Diercks learns about the human side of his research. Young Humphrey walks into the center of the crowd before his traditional mud-covered home. The metal jingles on the leather strips on his wrist, making a bright snap in the air. Surrounded by their voices, chanting softly and clapping, he leads the procession, draped in the skin and testicles of a bull sacrificed to mark this momentous change. They make a clearing for him. He stops silent before an elder, who carefully lifts off the skin. More than 100 of the boy’s family, friends and fellow villagers envelope him with whoops of joy and dance. The next phase of his coming-of-age ceremony has begun. Michael Diercks, assistant professor of linguistics and cognitive science at Pomona, smiles, watching the circle of bodies sway and jump. In an instant, many people reach out and pull him into the fray. They will celebrate throughout the night, encouraging 12-year-old Humphrey to have courage for morning, when he will go with them to the river to be covered in mud, and run home for the circumcision ritual to become a man. It is one of the most important events in Bukusu life—a rite of passage that few outsiders ever see. Humphrey’s parents trusted Diercks to share the event, and want to preserve it for future generations. Such intimate sharing and insight into Luhya language-speaking communities is the result of a multi-year collaborative international research project, of which Diercks is a principal investigator. A team of seven American linguists are studying four small Kenyan languages—Bukusu, Wanga, Llogoori and Tiriki. The team is supported by several grants, including a prestigious $477,000 National Science Foundation grant. Much of Diercks’ work so far was made possible by the Hirsch Research Initiation Grant from Pomona College. The team includes Pomona Linguistics and Cognitive Science Chair and Professor Mary Paster and Pomona linguistics students, as well as researchers at Ohio State University, Southern Illinois University, the University of Maryland and the University of Missouri. While there are more than 1.6 million speakers of the four Luhya languages, they are at risk, says Diercks, as everyday life changes to a less forested area and young people move toward English and Swahili for economic advantage. One example is the circumcision itself. More families are choosing hospital circumcision over the traditional way. “As the community changes, so does the language, and what isn’t preserved may be lost,” says Diercks. IN THE MOST comprehensive study of each of these languages to date, the team is collecting audio recordings from Luhya speakers and analyzing tone, sentence structure and other characteristics to describe how the language works. They are also collecting folk tales, narratives, songs and many other kinds of oral literature that document language use and aspects of each culture, as well as creating dictionaries for each language. Their research will be available in open-access venues for other scholars, and for Kenyans to learn about their languages. So far, the team has collected and begun to analyze more than 100 hours of audio samples by Luhya speakers. Diercks, and phonologist and co-primary investigator Michael Marlo, from the University of Missouri English Department, have spent a lot of time in Kenya fostering the close-knit relationships needed to gain trust and access to different communities. 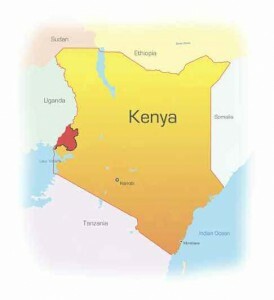 Diercks has been to Kenya many times. Earlier this year, he spent several months with a Tiriki family, gathering interviews and training Kenyan research assistants Kelvin Alulu and linguist Maurice Sifuna to collect interviews year-round. Back in California, the students in Paster and Diercks’ Field Methods of Linguistics course are at the center of Luhya work. As a Summer Undergraduate Research Program scholar, Samuels also spent the summer researching aspects of Llogoori with Paster. Since there is no published grammar of Llogoori, Samuels’ final paper from the previous semester is this fall’s required reading in the advanced fields methods class. “I was really proud,” he says. WHAT LUHYA SPEAKERS choose to share is a mixed bag. Linet Kebeya Mmbone spoke about hardships after losing her husband, and raising her children as a single mother without skills. Mungambwe talked about Llogoori history. Retired police officer Benjamin Egadwe spoke about how men used to have several wives, and changes in community since Christianity arrived. Ultimately, the stories will be shared with community members, along with images and stories generated by a volunteer photojournalist who spent several weeks in Kenya last summer. Together, they help to create an intimate portrait of the communities in which the linguistic team works; a snapshot of who they are and what’s important to them. Back at Pomona, the photographs and portraits are connections to the stories and texts students study, 9,500 miles away. This summer, Diercks was able to see the pride Benjamin and other Llogoori speakers have in their culture and in the language project, when Alulu organized a celebration of progress so far. They took motorbike taxis over windy dirt paths through the forest to their village. When they arrived, Mugangwe, Egadwe, and a dozen others ran out to meet them, dressed in their finest suits and traditional kanga cloths, and singing traditional greeting songs. They had walked hours into town for a goat, which they slaughtered for the feast.